Newspapers and technology aren’t exactly best friends. This house ad showed up on the International Herald Tribune’s home page today. 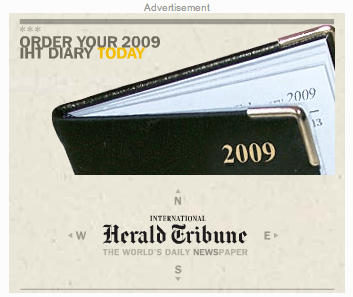 That’s right, the IHT seems to believe its target audience is people who still use paper diaries to stay organized. So what kind of damage would one of these bad boys do to a jet-setting executive’s wallet? A cool $49.95. Plus shipping. But wait! You can have it monogrammed! So that makes it alright. The most worrisome part of all this is that the IHT may be right and yes, in fact, the people reading one of the best newspapers in the world are the kind of troglodytes that still handle their appointments on paper. With monograms.